The last post was supposed to be a light-hearted blog featuring pregnant women, seeing as I am quite heavily pregnant at this time… but alas! Upon looking at its history, it had a darker undertone. So, with no further ado, here is a happier picture of the Visitation! 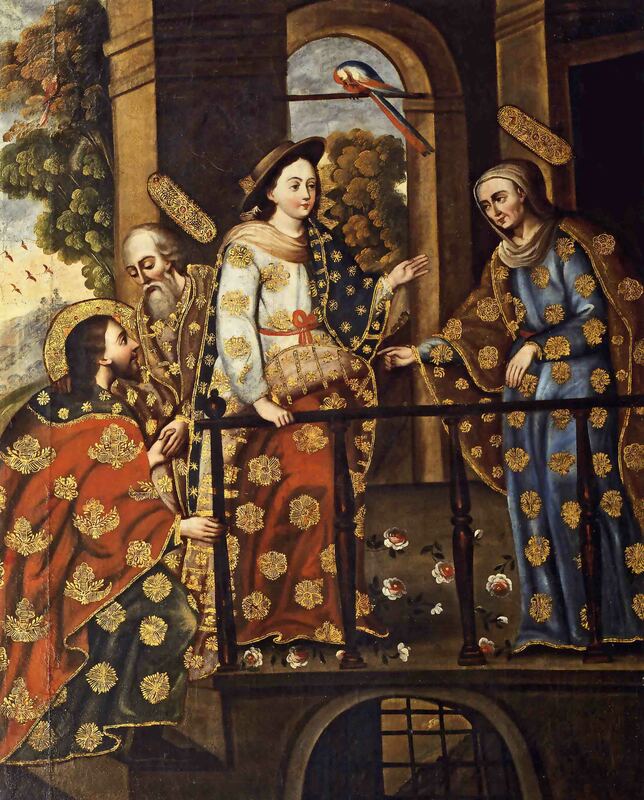 The Visitation, by Cuzco School, c. 18th century. Thoma Collection, Kenilworth, Illinois, United States. Why do I like it? Well, for one, it puts the scene of the Visitation in South America — probably Peru, as this is artwork that comes from the Cusco School. The clothes that they wear are beautiful and finally detailed with intricate gold embroidery, common in Cusco artwork. In the background, parrots fly and perch on lush trees while yet another parrot preens itself above the scene. And it’s a beautiful reminder as to how universal the church really is. In almost every culture, Mary is depicted as one of the people. Even here, in her bright colors and her wide brimmed, traditional South American Campero hat, she embodies the Peruvian standard of beauty back in the 18th century. The Cusco school loved our Blessed Mother so much that they made her one of them — and that is beautiful. What details caught your eye first in this very lush scene? If you had to place our Blessed Mother in your own environment, how would she look? What sorts of scenery and things would you surround her with? Help us love You more by inserting You and Your loved ones into our own lives. Did I mention that this artwork was featured in my book? The book goes through all of the prayers of the Joyful Mysteries of the Rosary and pairs each prayer with beautiful religious art. Check out a preview here!